b. Bungalows were one of the most popular residential styles in the nation during the first three decades of the twentieth century. These modest, comfortable houses were built primarily from mail-order house plans. South Florida bungalows are often one or one-and-one-half story wood frame houses with porch railing walls and oolitic limestone chimneys. Bungalows suit the local climate, with broadly pitched gable roofs with wide, overhanging eaves, deep porches, large sash windows, and dormer windows or louvered attic vents. Horizontal weatherboards and wood shingles are the most common exterior surfacing materials. Porch supports are often tapered masonry piers topped by wood posts. 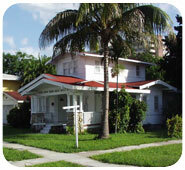 The most commonly found bungalow type in the Miami area has a gable roof, its ridge perpendicular to the street, and an off-center gabled front porch.